Sometimes keeping it simple is best and this gorgeous, minimalist bracelet by Evoke does just that. 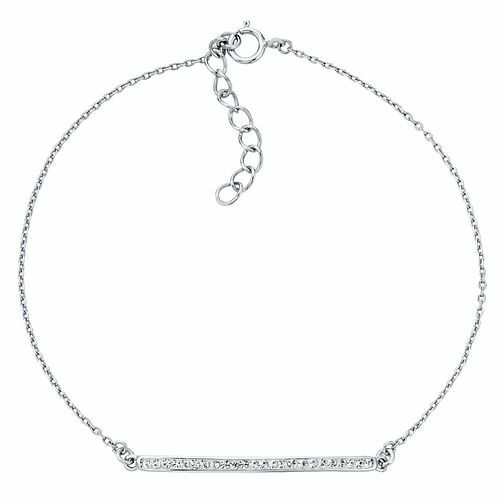 Rhodium plated for extra shine and set with shimmering crystals, this bracelet is ideal for those who love to sparkle understatedly, perfect to any occasion. Evoke Rhodium Plated Crystal Bar Bracelet is rated 4.0 out of 5 by 2. Rated 3 out of 5 by Anonymous from Product is smaller than anticipated and seems frail. Would return the item if it wasn't so much hassle. It is so small and frail that it doesn't seem worth the money spent. It's also too small to see any detail. But as it's a gift, I had no time to look for something else.